Weekly Climate and Energy News Roundup #328 | Watts Up With That? An Experiment – Testing the Core Hypothesis of Climate Models: The reports of the UN Intergovernmental Panel on Climate Change (IPCC) contain a morass of hypotheses, guesses, that are often untested. All too often the IPCC leadership dismisses challenges as meaningless or of little importance. For example, when the Fourth Assessment Report (AR4, 2007) declared that the glaciers of the Himalayan Mountains would melt by 2035, the government of India challenged this assertion. It was brushed aside. Ross McKitrick, Department of Economics and Finance, University of Guelph, and John Christy, Earth System Science Center, University of Alabama in Huntsville, have undertaken to identify a core hypothesis common to the climate models used by the IPCC and to test the hypothesis against the longest data set available that describes what is actually occurring. Along with Steve McIntyre, McKitrick found that the statistical techniques used by Mr. Mann, et al. in their “hockey-stick” produced such a shape from random noise. Along with Roy Spencer, Christy found a method for calculating temperature trends in the atmosphere from data collected by satellite, the most comprehensive almost global temperature trends existing. The condition for measurability requires that a prediction must refer to a target that is well-measured over a longtime span. The condition for independence requires that “once a model has been tuned to match a target [data], its reproduction of the target is no longer a test of its validity. In the case of GCMs, this rules out using the global average surface temperature record for testing, since during development models are often adjusted to broadly match its evolution over time.” This is a major problem with most GCM because they are tuned to surface data, not atmospheric data where the greenhouse gas effect occurs. If one tunes a model to a particular set of data, then one cannot test the validity of the model with that set of data. This eliminates using surface temperature data to test the validity of most climate models. They found: “Air temperature in the 200-300 hPa layer of the tropical troposphere meets all four test conditions, pretty much uniquely in the climate system as far as we are aware.” The 1979 Charney report and all five IPCC reports indicate that any CO2-caused warming will be amplified by an increase in water vapor, primarily over the tropics. [Using a standard altitude to pressure conversion table, the 200-300 hPa layer is approximately 30,000 feet (9100 m) to just under 40,000 feet (12,200 m) above sea level. The Pacific Climate Shift may be connected to the Pacific Decadal Oscillation (PDO). This shift produced a warming in the late 1970s that stopped the alarm of global cooling and an oncoming ice age. At the time, the sudden increase in temperatures was not understood. The PDO has been traced back for centuries. “The mean restricted trend (without a break term) is 0.325 +/- 0.132ºC/decade in the models and 0.173 +/- 0.056ºC/decade in the observations. With a break term included they are 0.389ºC/decade (models) and 0.142 +/- 0.115ºC/decade (observed). Figure 4 shows the individual trend magnitudes.” The break-term is the adjustment for the PCS. During the 60 years covered, the CO2 concentration at Mauna Loa went up 29%. As McKitrick’s states in his post, this finding shows that “models misrepresent a process fundamental to their usability for studying the climate impacts of greenhouse gases.” That is, the models show warming trends that are significantly greater than the observed warming – about 2.7 times the observed trend for the data sets that include the PCS (PDO). The warming bias in the models should be unacceptable for any prudent government agency, including the EPA which relies on the GCMs for its finding that CO2 endangers public health and welfare. Probably there is little that can be done about the UN IPCC. It is in a world of its own. But any US government agency that uses such models to establish policy should be viewed with great skepticism. See links under Challenging the Orthodoxy. The Jason Model: Last week’s TWTW mentioned a 1979 report on global warming by JASON, a group of independent scientists who advise the government. TWTW had not been able to find the report. Reader Gary Pavek promptly sent TWTW an April 1979 Technical Report JASON, “The Long-Term Impact of Atmospheric Carbon Dioxide on Climate.” It had been retrieved from Google records. The report was prepared for the Department of Energy and stated that “neither the ocean-atmosphere nor the atmosphere-biosphere interfaces are well understood.” They are still not well understood, underlying the importance of the McKitrick-Christy test which pertains only to a layer of the atmosphere, which should not be greatly influenced by these interfaces nor by human land use change, such as urbanization. The report states: “The JASON climate model suffers from a number of fundamental weaknesses. The role of clouds in determining the albedo is not adequately taken into account nor are the asymmetries between the northern and southern hemisphere.” Both these issues remain in GCMs today. TWTW could find no empirical justification for increasing the absorption ability of these weak CO2 bands. Certainly, when the neighboring bands become saturated, there may be some spillover effect, there is no logical reason to assume that the absorption ability of CO2 would greatly increase above what is indicated by laboratory experiments. Unlike the models used in the Charney report, the Jason climate model did not assume an increase in water vapor and had the extreme warming occurring in the polar regions not the equatorial region. Since 1979, the atmosphere above the North Pole has been warming, but not the atmosphere above the South Pole. The Department of Energy has a new climate model. A quick review of the web site revealed that the new model includes issues on the optical depth of aerosols. Optical depth is a term-of-art applying to the transparency of gases to radiant energy. However, a quick review did not reveal any further research on the change in optical depth of CO2, which is assumed to change in the Jason Model. TWTW will search further. See links under Defending the Orthodoxy. Will Happer Debate: Writing in WUWT, Andy May discussed a “Great Debate” series between Dr. David Karoly and Dr. William Happer. The debate was conducted in writing. Karoly is a “climate scientist who has been heavily involved in several IPCC reports and first described the famous ‘atmospheric fingerprint’ (cooling in the stratosphere and warming in the troposphere) that shows rising greenhouse gas concentrations have an impact on recent surface warming.” [This is different than the Santer “human fingerprint.”] Will Happer was discussed in last week’s TWTW. The first part presented arguments regarding how unusual recent global warming is and how we know the recent observed increase in CO2 is due to human activities. In the second part they presented their thoughts on the amount of warming caused by greenhouse gas emissions and the accuracy of the calculations. The third part, they address dangers of global warming, the calculation of the value of ECS (the equilibrium climate sensitivity to a doubling of CO2), and the need to do something about climate change. The fourth part is a summary prepared by Andy May. Unfortunately, Karoly dropped out, and responses to Happer’s comments were handled by Glenn Tamblyn, a blogger for the web site skeptical science, which accepts the IPCC view and became dogmatic. See links under Seeking a Common Ground. AGs for Sale or Rent? CEI professional Chris Horner has uncovered a disturbing trend in the offices of some state attorneys general. Environmental groups are hiring attorneys to work in the offices of these state attorneys general under the disguise that they are “pro bono” volunteers. Depending on the laws of the state, this may or may not be legal. But it is doubtful that a state attorney general will press charges against his own office. When his term of office expired, Virginia Governor Bob McDonnell was immediately arrested on federal corruption charges for receiving improper gifts and loans from a Virginia businessman. He was tried and convicted. It took two years, but his conviction was unanimously vacated by the US Supreme Court. It found there was no crime – no quid pro quo – no evidence that an “official act” was made in exchange for favors. Simply setting up meetings was not sufficient. What McDonnell did may have been distasteful, but not criminal. The actions of the AGs in accepting “volunteers” paid by third parties into their officers may be just distasteful. But if these volunteers are involved in “official acts” it may become criminal. Note: Ken Haapala knows attorney Chris Horner who was very persistent in uncovering fictious EPA employees used to disguise messages from past EPA administrators. See links under Expanding the Orthodoxy. Some researchers have advanced the concept that dust accumulation on the ice sheets in conjunction to the increase in solar intensity are important. Using basic calculus Rapp advances this position. Writing in the Global Warming Policy Forum, David Whitehouse explores the relationship between the Maunder Minimum and the Little Ice Age. It is not straight forward and there may be a number of relationships that are not understood. The complexity of solar influence in the Northern Hemisphere may involve much more than what is generally discussed. 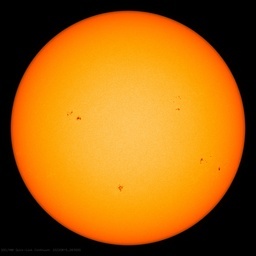 See links under Science: Is the Sun Rising? Hurricane Florence: Upon reaching the East Coast at the Carolinas, Hurricane Florence stalled, and its winds abated. This is very fortunate in terms of destruction from high wind, but unfortunate in terms of flooding. Such storms show we still need a better capability in predicting severe storms, and their intensity. Of course, the storm was accompanied with the usual babble that it was an example of CO2-caused global warming. As a side note, Anthony Watts posted an amusing video clip of a reporter struggling against the storm, as two people in the background strolled by. See links under Changing Weather and Below the Bottom Line. Number of the Week: $5.20 and $6. 50 per million BTU. TWTW has seen numerous estimates of the cost of shipping liquified natural gas (LNG) from the Gulf Coast to Europe and Asia. Based on assumptions made in preparing the Natural Gas Market Model for the Annual Energy Outlook, 2018, the US energy Information Administration estimates the cost of shipping from Sabine Pass, Louisiana to Europe is $5.20 per million BTUs and to Asia $6.50 per million BTU. These costs include a Liquefication and Pipe fee of $3.36, Transportation cost to Europe of $1.20, Transportation cost to Asia of $2.48 Regasification cost of $0.11 and a Fuel surcharge of 15% of Liquefication and Pipe fee. The costs do not include the cost of the natural gas. The costs of shipping from Cove Point, MD are slightly higher, even to Europe. Additional facilities are coming on-stream, which the EIA included in its additional estimates. The natural gas boom is for real, and companies are scrambling to build natural gas shipping facilities. The first few that complete in construction and commitments will probably profit handsomely, the rest, less so. Science: Is the Sun Rising? Several international initiatives are working to stitch together data describing solar forcing of Earth’s climate. Their objective is to improve understanding of climate response to solar variability. Get Ready For Insane Climate Ambulance Chasing Headlines: Global Warming Causing “Unprecedented Hurricane” Florence! Communicating Better to the Public – Exaggerate, or be Vague? Communicating Better to the Public – Make things up. These Are the Ten Most Polluted Cities in the World—Really? Germany has seriously overestimated how much its neighboring countries are able to help out in the event wind and solar energy fail to deliver, thus putting it’s power supply at risk. What is energy security, and how has it changed? Oil and Natural Gas – the Future or the Past? Did Thomas Kuhn Kill Truth? A debate on the nature of truth turns into a squabble over whether the father of the “paradigm shift” threw an ashtray at Errol Morris’s head. “A lower birth rate would help cut greenhouse gas emissions, a report released today claims. Each Briton uses nearly 750 tonnes of CO2 in a lifetime, equivalent to 620 return flights between London and New York, the Optimum Population Trust warns. “Based on a cost of 42.50 pounds per tonne of CO2, the report estimates that the price for the climate of each new person over their lifetime is roughly 30,000 pounds. The bill for the extra 10 million people projected for the UK by 2074 would reach more than 300 billion pounds. “The man who inspired a generation of backpackers to see the world has claimed that travelling is environmentally destructive. Mark Ellingham, the founder the Rough Guide series of books, is urging holidaymakers to cut down on foreign flights. Jerry Brown signs the statewide ban on fossil-fuel power by 2045. “Gov. Jerry Brown on Monday signed a bill requiring that 100% of California’s electricity be generated by renewables like wind and solar by 2045. The price of his green virtue won’t be cheap. It shows a graph based on EIA numbers that residential costs of electricity in 2018 are about 50% greater in California than the US average, about 30% greater than in New Jersey. That ‘stuff’ is costing Californians dearly. See the nearby chart tracking residential electricity rates since 2011. Plunging natural gas prices—the wholesale price has fallen 28% since 2011—due to the shale drilling boom have curbed electricity rate increases in most states. But California has moved most aggressively against fossil fuels, and what do you know? Its electric prices have risen the most in the country outside of New England, which suffers from a natural gas shortage due to inadequate pipeline capacity. Since 2011 California’s electricity rates have surged 30% compared to an 8% increase nationwide and 15% in Washington. Rates in some states like Florida (-3%) and New Jersey (-2%) have fallen modestly. Seven years ago California’s electricity rates were 27% higher than the national average. Today, they are 53% higher. California’s 100% mandate will require utilities to pay even more for new renewable generation, battery storage and transmission. The state will need about 200 times more energy storage than it currently has to compensate for gas-fired plants. Green cross-subsidies also drive up retail electricity prices. For instance, utilities pay rebates to homeowners with solar panels in addition to compensating them at the retail rate for surplus energy they remit to the grid. Liberals say Californians won’t pay more for electricity because efficiency mandates will reduce consumption. But low-energy appliances are more expensive and can, well, backfire. Customers have complained that tankless water heaters in larger homes require additional equipment to expedite hot-water delivery that can end up driving up energy costs. Gov. Brown has also directed the California Air Resources Board to develop a plan to achieve ‘carbon neutrality’ by 2045 so that the state emits as much carbon dioxide as it removes. This would literally require everyone to drive electric cars and farmers to develop technologies to capture cow flatulence—long after Mr. Brown has stopped exhaling CO2 himself. Crack news organizations deployed narratives ahead of the storm. “Hurricane Florence continues to pour historic volumes of water upon the Carolinas, causing several deaths, leaving hundreds of thousands of people without power, flooding vast areas of the region, and sending many residents in search of food and shelter. “Meanwhile American news consumers are finding no shortage of pundits eager to define the disaster as the result of allegedly insufficient government regulation. This analysis represents a high level of preparedness. In the days and hours before Florence made landfall, many media outlets deployed anti-market narratives in the coverage areas where editors believed they could be most useful. “President Trump issued several warnings on his Twitter feed Monday, counseling those in Florence’s projected path to prepare and listen to local officials. That was good advice. “Yet when it comes to extreme weather, Mr. Trump is complicit. He plays down humans’ role in increasing the risks, and he continues to dismantle efforts to address those risks. It is hard to attribute any single weather event to climate change. But there is no reasonable doubt that humans are priming the Earth’s systems to produce disasters. “’Since 1990, the global population has increased by more than 2.2 billion, and the global economy has more than doubled in size. This means more lives and wealth are at risk with each successive disaster. “’Despite this increased exposure, disasters are claiming fewer lives. Data tracked by Our World in Data shows that from 2007-17, an average of 7,000 people each year were killed by natural disasters. In the decade 50 years earlier, the annual figure was more than 37,000. Seven thousand is still far too many, but the reduction represents enormous progress. After asking how appropriate Pielke’s comments are for North Carolina, the author then goes into a discussion centering on how frequently should building codes be updated. September 17, 2018 in Climate News Roundup. Further to the “Academic Activists Send a Published Paper Down the Memory Hole” link above, I note an article by the Guardian journalist George Monbiot. Now, George isn’t everyone’s cup of tea, personally I find his political observations incredibly irritating as it is simply blind leftism however, as a Zoologist I find him engaging, articulate, well informed and invariably quite logical. Zoology is, of course, his area of scientific expertise, his politics is as confused as most amateur commentators, and I include myself in that. Occasionally though, George ventures off-piste with some success, as the following coincidental (I assume) article demonstrates. In it he challenges the validity of scientific journals on the basis that scholarly articles should be freely available to everyone, especially when the taxpayer has already coughed up the funding for the research itself. Instead, journals are making out like bandits by charging for research papers they arguably have no excuse now for doing so. Wrap this all up with the ongoing peer review scandals and even to a layman like me, something within academia stinks to high heaven. A short article by George and well worth a read. Comments by Rapp on the “End of Ice ages” essentially explore that change in solar output seem inadequate to explain the amount of warmth needed to force an interglacial. I was graduated in 1962 in geophysics. Lecturers would explain that theoretically one could take carbon black or soot and distribute it over the the ice sheet to force melting. One theory then, was that ice formation was driven by precipitation via an open Arctic Ocean. Somehow moisture would fall as snow on a frozen continent. The other theory reviewed was Milankovitch periodicity. The key was not so much the amount of snow but how much was lost in the melt season. At the time there was not enough evidence to decide either way. Then, the data started to roll in–confirming Milankovitch. But the swings in temperature have been greater than just orbital mechanics could explain. The paragraphs above mentioned the dust theory, which could be inadequate. Why did they not include Svensmark and Shivav on Cosmic rays? Which forcing of cloud covers provides a wonderful explanation.